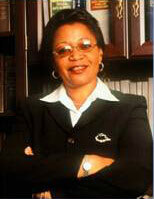 There has been no let up in President Kikwete’s extremely energetic governance of Tanzania during the last few months. Some of his actions and the statements he has made give further indications as to his future policies and what he wishes to achieve. 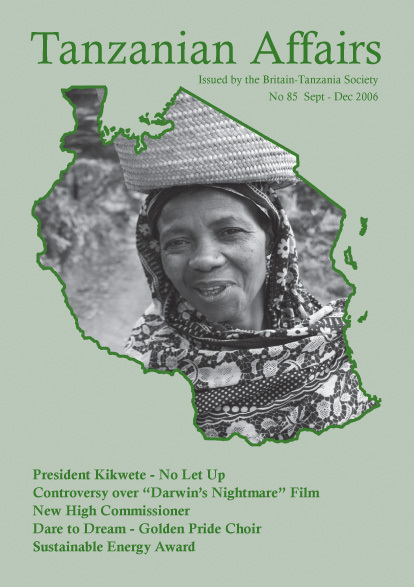 President Kikwete has joined an increasing uproar about the controversial film ‘Darwin’s Nightmare’ which is reviewed on page…. below and which was broadcast on BBC TV recently. Our regular contributor Dr Hildebrand Shayo reports that the President was angered when he saw the film. He wondered how Tanzania’s security services could have allowed the interview material collected in Mwanza and used in the film to have been obtained. The President was said to have been looking into the matter himself during a rest holiday he had been taking in Mwanza. Tanzania’s new High Commissioner in London is H.E. Mwanaidi Sinare Maajar. The previous HC, Mr Hassan Omar Kibelloh, has been transferred to Paris. On 23 May three judges in the High Court announced decisions contrary to the wishes of the government. The situation in Zanzibar has been more calm than many observers anticipated after the hard fought elections in October 2005. One of the main reasons is that President Kikwete has made it clear that he is determined to relieve the tensions existing between the CCM-supporting island of Unguja and the Civic United Front (CUF)-supporting island of Pemba. However, CUF Secretary General, Seif Shariff Hamad, is getting impatient. He has said that the people of Zanzibar are not prepared to see Amani Karume celebrating his first anniversary as the isles’ President before the current political stalemate is resolved. He said “We know how good CCM are at playing with time. They talk a lot without action. We now want them to tell us what they intend do.” He said that the only way forward would be to form an interim coalition government prior to holding fresh elections – Mwananchi. More than 400 people have been hired to implement Zanzibar’s major new anti-malaria initiative, which started in Pemba in July, and is aimed at spraying insecticide around some 220,000 houses. The compound being used is said to be environment-friendly and to have the potency to control the breeding of mosquitoes in and around households for at least six years. Known as parathyroid-lambdacyhalothrin (IOWP-ICON), the chemical is manufactured by Syngeta, a Swiss company. The exercise has received $2 million from the US government’s anti-malaria initiative and is intended to be repeated every six years. It is hoped to reduce malaria prevalence from the current 31% to below 15%. Zanzibar’s legal status as a semi self-governing part of the Tanzanian Union is being questioned in court by ten Zanzibaris calling themselves the ‘G10’. They claim that the original eleven articles of the Union Constitution were hastily drawn up in April 1964 in the aftermath of the bloody Zanzibar revolution by the presidents of the two states which were then separate – Julius Nyerere of Tanganyika and Abeid Karume of Zanzibar. The G10 claim no connection with any political party. They have filed a civil case against the Zanzibar Attorney General, the Secretary-General of the Zanzibar Revolutionary Council, the Speaker of the Zanzibar House of Representatives, the UN Secretary General and the Secretary General of CCM for agreeing to the formation of the Union. But in August the High Court ruled out the possibility of UN Secretary General Kofi Annan giving evidence in the case. According to Tanzania Daima President Karume of Zanzibar has complained to the British government that the CUF Secretary General does not respect ‘people’s verdicts’. He said this to the new British High Commissioner, Philip Parham, who called on him at the Zanzibar State House. Karume said it is risky to entrust power to opposition leaders who had no political culture of bowing to public demands. A statement by the State House quoted Karume as saying: “What can jeopardise political stability of the country is the fact that some leaders of opposition parties cling on to power, which is not acceptable in a democratic society.” Karume did not mention names but it became obvious that he was alluding to CUF Secretary General Seif Shariff Hamad who has been a Zanzibar presidential candidate in three consecutive elections. Karume told Parham that his government is currently concentrating on Pemba to bring about balanced and equitable development in the isles. CUF Director of Information, Salim Bimani, rebutted Karume’s statement, saying Hamad had always been democratically approved as presidential candidate by relevant party organs, but every time he wins the election CCM and Zanzibar government leaders doctor the results. Opposition CUF MP’s have been voluble in their criticism of several recent government actions. Relations between the two parties in the House were not improved when Speaker Pandu Kificho banned CUF shadow ministers from reading speeches before he had perused them. CUF MP’s walked out of the House in protest after he said: “All statements to be delivered in this chamber – such as bills, private motions – have to be cleared with me. You have not complied with my directives, therefore I am not allowing you (the CUF Shadow Minister of Finance) to deliver your speech on the budget.” CCM MP’s praised the Speaker for his action, which he explained by saying that his objective was to “control rude and emotional speeches in the House.” Then, on August 5, according to Yussuf Yussuf writing in the Guardian, CUF Deputy Secretary General, Juma Duni Haji, said that his party would forward its complaint to the Commonwealth Parliamentary Association (CPA) because they wanted the Commonwealth to know what had happened. Zanzibar Chief Minister Shamsi Nahodha has defended in the House Education Minister Haroun Ali Suleiman. A number of MP’s want the Minister to resign as they accuse him of being responsible for the 800 ‘ghost workers scam’, in which the government has been losing TShs 73.8m/- every month in payments to non-existent public servants. Nahodha exonerated the Minister, saying he could not be held accountable for mistakes committed by his subordinates. “That’s not in our customs” he said. “In Zanzibar, there is no tradition that compels leaders (or ministers) to resign when facing such scandals.” The Chief Minister said that, if that norm existed, many political leaders would have stepped down for failure to fulfil their pledges, adding however, that the government was still investigating the matter – Guardian. In its attempts to curb armed robbery in the Isles, the Zanzibar Government stated in July that it was deploying soldiers from the armed forces to supplement the efforts of the police. The soldiers would be on guard at business centres, road junctions and related places around the clock. The Police confirmed that several youths had been arrested in connection with armed robbery at a shop and soldiers had rescued businessman Mohamed Raza, from cross-fire with armed robbers who had attempted to raid his house – Guardian. National Identity Cards will be issued to some 17 million Tanzanians starting in the financial year 2007/08. The new budget includes TShs 3 billion for the preparations. There will be two types of ID card – one for citizens and the other for foreigners. The Minister of Finance said that the issuance of national identities would be a major step in the fight against poverty because anyone who wanted a loan would use the ID to secure it. Precision Air, Tanzania’s leading airline, has bought six brand new aircraft from a France-based company – ATR. The new fleet will include three ATR 42-500 and three ATR 72-500, which are improved versions of the ATR aircraft currently operated by the airline. Precision Air flies to destinations all over Tanzania and to Nairobi, Mombasa, Lilongwe and Blantyre. The carrier has been nominated 2006 ‘Airline of the year’ by the Tanzania Tourist Board in recognition of its fast growth and network expansion. The airline issued its first e-tickets in March this year thus becoming the fifth airline in Africa to successfully implement this latest technology. The airline is jointly owned by Kenya Airways (49% per cent of the shares) and a Tanzanian businessman, who controls the remaining shares. The Dar es Salaam Water and Sewage Corporation (DAWASCO) has started to disconnect some 40,000 non-paying customers. At the end of July some DAWASCO staff were temporarily detained by angry customers who attempted to resist water disconnection, demanding an explanation. There was then further drama when staff caught up with a fleet of 25 trucks harvesting water from its pipes illegally at the Ubungo National Housing Flats area in the middle of the night. DAWASCO has sacked 17 workers who had allegedly colluded with consumers to cheat. Meanwhile opposition MP’s said that the Prime Minister (then Minister for Water) should be held responsible for the loss that resulted from the termination of the City Water contract with the government (see earlier issues of TA). The case has been brought by British firm Biwater, City Water’s holding company in London. The MP’s noted that funds to support the defence in the case had been amongst the priorities in the Ministry of Water’s 2006/2007 budget – Guardian.